You are at:Home»Featured»NETIZEN CLAIMS THAT THE WAIT TO SEE A OTTHOPEDIC SPECIALIST FOR HIS SWOLLEN LEG IS A 5 MONTH WAIT! 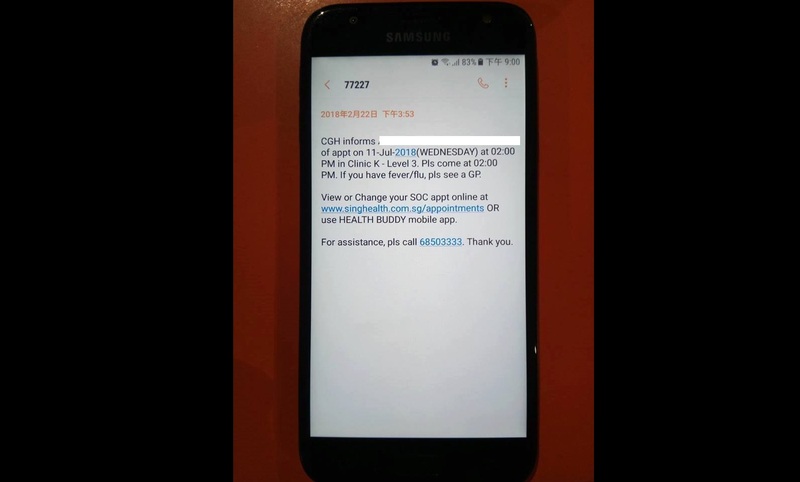 A reader sent in an appointment schedule by CGH to see a orthopedic specialist and the wait for the subsidised consultation for his swollen leg is a lengthy 5-month wait! The message was sent out on 22 Feb for a first appointment schedule on 11 July after he has seen a GP at a polyclinic for his leg swell. Either there is a long waiting list for orthopedic services or there is a lack of orthopedic specialist or both which is more probable. In fact, the polyclinic has advised the patient to go to A & E services which charge a hefty premium so that he can have immediate access to a orthopedic consultation for his swollen leg! We know that polyclinic charges are often heavily subsidised and the wait can be very long – but five months!? As the country prepares for a GST hike in about 3 years’ time and the government has promised more healthcare expenditure in the near future, one wonders if this particular patient has the health or the luxury to wait five months to see a specialist? Will he lose his leg in the process? What if the patient has a life-threatening illness, will the patient still have to wait a few months for subsidised government healthcare services? Will it be better if we just die?! Previous ArticleVIRAL PHOTO TAKEN AT RAFFLES PLACE IS ACTUALLY A PHOTO AD BY AN APP! Next Article FATTY PORK LISTED TOP 10 MOST NUTRITIOUS FOOD BY BBC!